Adrian Pacheco, 18, was arrested and charged with 2 counts of Burglary and Possession of Burglary Tools. At about 11:33p.m., the Albuquerque Police Department received a 911 call from an observant neighbor who called police and said they saw an unknown male, later identified to be Pacheco, at her neighbors home. The neighbor said she did not think the homeowner was home and observed the male removing a screen from the upstairs window. Officers arrived to the area and were able to determine someone was inside the residence after finding damage to the back door and finding the inside of the home in shambles. Just about that time, the homeowner arrived home from church and she told the officer no was suppose to be in her home. Officer then observed Pacheco emerge from the open upstairs window where he spotted police. 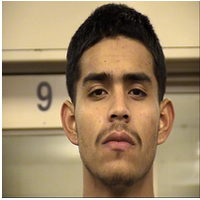 Pacheco jumped from the rooftop into the backyard and leaped over fences in the area in an attempt to elude police. Officers were quick to set up a perimeter and called for the assistance of the Albuquerque Police K9 Unit. Pacheco was located by the K9 officer and taken into custody. During the investigation officers found Pacheco had stacked several of the homeowners belongings near the window and had ransacked the entire home. Pacheco was also found to be in possession of the garage door opener from a vehicle the victim had parked in the garage. Police are unsure if Pacheco planned on returning to the home at a later time. Thanks to the caller reporting the suspicious nature of Pacheco and being a fantastic neighbor this arrest was made possible and the homeowner was reunited with her belongings. The field officers and the K9 unit did a great job on catching another burglar red-handed. We want to remind citizens not to leave valuables such as garage door openers, credit cards or anything of value in vehicles. A thief obtaining these items could be used as a gateway to other crimes. Continue to keep a lookout in your neighborhood and to continue reporting anything suspicious to police.